Just had to post this image of a Canna that we took earlier today in the beautiful September sunshine. 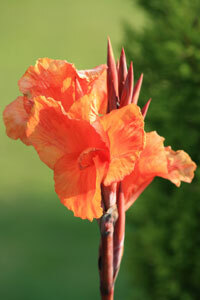 This flower in particular never ceases to amaze with it’s vibrant orange tones. Really easy to grow and simple to keep. We grow ours in a large clay pot, in the same compost for the last 3 years. Apart from the occasional feed with organic fertiliser we do very little to them. Only thing to watch is over wintering as they are a little tender. Stand the pot in a frost free corner of the garden and cover with a little straw and they’ll be fine.